Was Alex Smith the product of Tyreek Hill, or vice versa? The answer is the egg. Evolutionarily speaking, some sort of pre-chicken birds laid an egg that hatched a chicken, ergo the egg came first. It’s not a satisfying answer, tautologically speaking, but it’s the right one. A harder question: What came first, the Alex Smith who was a successful deep passer, or the Alex Smith who had Tyreek Hill on his roster? That question is going to be put to the test in 2018, as Smith will still be a quarterback, only he’ll be one without Hill, one of the league’s fastest receivers. First, the reason for the question. Smith led the league in deep (20-plus-yard) passing yardage in 2017, and did so comfortably — his 1,344 deep yards were 212 more than second-place Matthew Stafford. His deep accuracy percentage of 56.5 paced the league as well, and his 12:1 TD:INT ratio on such passes was easily tops among qualifiers if you exclude Mitchell Trubisky’s 3:0. Of course, Hill was there. Hill had 628 receiving yards on those deep passes, also best in the league, 20 more than Brandin Cooks. He scored six times, behind only Robby Anderson’s seven. And only JuJu Smith-Schuster (54.5 percent) caught a higher percentage of his deep passes than Hill’s 54.2 among qualifiers. The easy way to look at that is that Smith, always known as a dink-and-dunker, became prolific as a deep passer when he got Hill. But is it true? Here’s a big one: In 2017, Hill had a 131.4 passer rating on deep passes, tops in the league. Take out every single attempt to Hill, and Smith’s deep-ball passer rating was … 126.6 — or still the best in the league on deep passes. Hill helped, but Smith was a deep-ball success without him (hat tip to PFF’s Mark Chichester for that tidbit, because he’s cleverer with stats than I am). 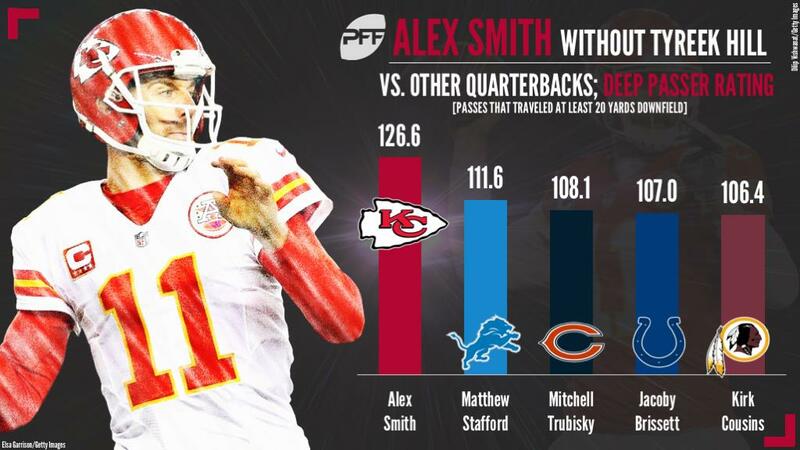 Smith also attempted the most deep passes of his Kansas City career in 2017 — 62, bettering his previous high of 46 in 2016. So, point in Hill’s favor: Smith averaged 35 deep attempts per year in his three years in Kansas City pre-Hill, and 54 per season with Hill. The flip side of that, of course, is that Hill could have been any warm body at wide receiver. In 2014, the Chiefs got 171 fantasy points total out of the wide receiver position, famously getting no touchdowns from the position all year. Since 2006, 10 teams have failed to reach 200 fantasy points out of receivers, but none has fared worse than the 2014 Chiefs. Things were better in 2013 and 2015, but still, the Chiefs didn’t have much wide receiver success: Dwayne Bowe was the team’s top fantasy finisher in 2013 and 2014, finishing 44th and 61st, respectively, in wide receiver fantasy scoring those two years, while Jeremy Maclin led the way in 2015 and finished 17th. Prior to Tyreek Hill’s arrival in Kansas City, this was an offense that leaned on the running back (namely, Jamaal Charles) with help from a tight end (Travis Kelce) and a wide receiver in Maclin who has never been known for his deep-ball acumen. Yes, Hill helped Smith’s deep production, but you could easily argue any deep-ball specialist receiver would have done so. What does it mean for 2018? Smith now takes his talents to Washington, leaving Hill behind in Kansas City. Instead, he has Josh Doctson as his primary (for now?) deep threat in the Washington offense, with Jamison Crowder, Jordan Reed, and Chris Thompson as the supplementary receiving weapons. I’ve said it a thousand times, but you’ll never go broke betting on players not to repeat their career years. In four years in Kansas City prior to 2017, Smith had 11 touchdowns against 5 interceptions on deep passes, with 1,599 total yards. In 2017, those numbers were 12, 1, and 1,344. Yes, he had more attempts in that department, but still, that’s definitely career-year-esque numbers. That’s a drop of almost 300 deep yards a year, just by simple attrition. Smith in Washington is unlikely to reach 1,344 deep yards in 2018, but Smith anywhere (including Kansas City) wasn’t likely to do that again. Did Tyreek Hill help make Alex Smith a fantasy success in 2017? Sure, of course. But this was a player having his career year either way. Don’t expect Josh Doctson to be Tyreek Hill in 2018, but don’t call Alex Smith a bust if that’s the case.